At a roundtable in Taipei, Global Finance brought together key figures in Taiwan’s banking and finance industry to discuss the prospects for one of Asia’s most successful export-driven economies. 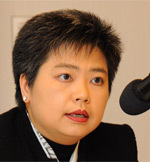 Since 2008, Yen has been the director general of the economic research department at the Central Bank of China, Taiwan. His prior roles at the central bank include deputy director general of the economic research department and assistant director general and section chief, international balance of payment section of the economic research department. 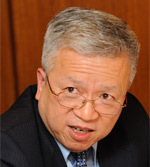 Before joining the central bank, Yen was associate research fellow at The First Research Division, The Chung-Hua Institution for Economic Research. He has a Ph.D. in economics from Michigan State University in the US, an M.A. in economics from National Chengchi University, Taiwan, and a B.A. in economics from Tunghai University, Taiwan. 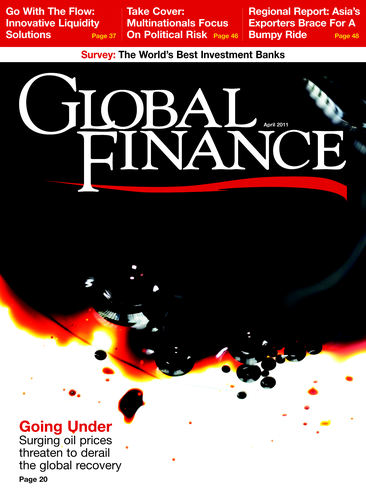 Global Finance: How has Taiwan’s economy performed lately, and what is expected in the near term? Is inflation, particularly imported inflation, a concern? Tzung-Ta Yen, director general and head of the department of economic research, Central Bank of the Republic of China (Taiwan): Last year, Taiwan’s economy experienced a strong recovery. According to the latest estimates by the DGBAS (the Directorate General of Budget, Accounting and Statistics, a cabinet-level office), the economy is projected to have grown by 10.82%. For this year, the improving global macro-environment, rising demand from the emerging markets, and the boost from Taiwan’s signing of the ECFA (Economic Cooperation Framework Agreement) with China, export growth will gain momentum. But the growth of exports and imports generally will slow down, mainly due to the higher base effect. Moving on to domestic demand, consumer confidence and spending have been boosted by the improving employment situation and rising incomes generated by the economic recovery. Therefore, we expect private consumption to increase steadily. In addition, the government continues to promote urban regeneration and attract foreign direct investment. However, private investment could post negative growth this year also due to a higher base effect. All in all, it looks like Taiwan’s economy will maintain a moderate growth this year, and according to the DGBAS’s forecast, GDP should increase by 4.98% this year. However, there are several risks for Taiwan’s economic performance this year. First, inflation in China has become a growing concern. As a result, it might dampen Taiwan’s export performance in the future. Second, the global economy is recovering. However, the question is: How far can the US and the euro area recover and bring down their unemployment rates? The third risk I would like to point out is the enormous liquidity as a result of quantitative easing of the US, the ECB, and the Bank of Japan. Huge capital flows have led to a highly volatile international financial market and heightened risks of asset bubbles. The final risk: Higher oil and raw materials prices will influence Taiwan’s import prices. As for the issue of inflation, the CPI inflation in Taiwan has always been low and stable compared with other countries. Recently, international prices of raw materials, such as grains, have been persistently higher and higher. So, inflation pressures are felt across the world. Indeed, just last month, Global Insight already revised up the world CPI for 2011 to 3.35%. The forecast is apparently higher than the 2.82% registered last year. We all know that rising prices of imported raw materials lead to cost-push inflation. The exchange rate appreciation helps contain imported inflation, but rising imported inflation may continue to push up domestic prices. Last year, Taiwan’s CPI increased by only 0.96%. According to the DGBAS, this year, the annual CPI growth rate is forecast to rise by 2.0%. In other words, inflation here will be moderate. Hsu started his career in Citibank Taipei as 1988 as a trader covering foreign exchange, money markets, fixed income and derivatives. He became head of trading in 1997. After 15 years of service at Citibank, Hsu joined Chinatrust Bank in 2003 as head of financial markets. He is now the head of capital markets for Chinatrust Bank, where he oversees sales, trading and asset liability management functions in the trading room and the corporate finance business. Larry Hsu, senior executive vice president, Chinatrust: Economic growth over the past year was excellent, and I genuinely believe that this year we can reach 5%. The fundamentals are good, but rising inflation pressure could become a concern for Taiwan’s market. Although the current inflation figure is low, if you look at the rising commodity prices and take into consideration the inflation pressure from mainland China, it would be betterenor Taiwan to be cautious about the spill-over effect from mainland China because our economic ties will be getting closer. In the near term I don’t think there will be tremendous pressure in terms of pricing, but we need to maintain a very cautious stance, and perhaps take some precautionary measures. Helen Hui, head of wholesale banking, Standard Chartered: After the financial crisis, Asia as a whole bounced back a lot quicker than the West. Taiwan has performed very well in a number of areas, particularly tourism and trade exports. The strengthening economic ties between Taiwan and China are boosting tourism—it’s now the second biggest growth engine in Taiwan’s economy—and also boosting consumer confidence. As for inflation, it’s still a relatively low number. Our house view is that inflation will reach 2.2%. That’s definitely not as high as China’s, and it is growing on the back of the commodity prices, which is true in all economies in Asia. I think that’s a concern, but not a huge concern. Inflation in China may have another impact on Taiwan, though, because of Taiwan’s investment in manufacturing in China. That’s a growing concern. Greg Gibb, chief operating officer, Taishin Financial Holdings: Things are clearly looking up and the prospects for Taiwan for the next three years will be a lot better than the past 10 years. It is facing a challenge in terms of how broad-based the economic recovery is, though. The top listed companies are doing very well—the exporters that are strong in IT or traditional manufacturing and those that have a global competitive advantage—and that’s flowing through to stock prices and creating the headline sentiment that’s driving the GDP and the GNP numbers. But if you go down to the man on the street, Taiwan faces a challenge that’s similar to that facing the US. Corporate profits getting better, but is it really trickling down? Clearly there’s some trickle-down into the broader economy, but it’s still somewhat limited. GF: Does Chinese inflation have a direct effect on Taiwan? Yen: Rising prices in China affect Taiwanese businesses that operate there. Since the inflation in China is mainly related to the prices of basic necessities such as housing and food, and we do not import a lot of agricultural products from mainland China, Chinese inflation has a minor effect on Taiwan. As managing director and head of origination and client coverage at Standard Chartered’s wholesale banking group in Taiwan, Hui is responsible for the strategic direction of the bank’s corporate and institutional client franchise in Taiwan. Helen is a member of Standard Chartered’s Business Leadership Team, where she is one of the bank’s top 300 senior executives. Prior to moving to Taiwan, Helen was head of multinational corporates, wholesale banking, Hong Kong, where she had responsibility for client relationship management among major corporations headquartered in Europe, US, Australia, Japan, and Korea. Hui: Taiwan’s manufacturing base in China is quite large and inflation there leads to increased wages, which means it’s increasing the costs of the production. They already have relatively thin net margins, so there will be some stress there for Taiwanese companies. Hsu: Monetary policy in Taiwan is still quite loose. There is a lot of excess liquidity on the street chasing after the goods, so that’s another reason for us to be very cautious about the potential inflation pressure—not just from China but from our own monetary policy, too. GF: What has been Taiwan’s experience in managing capital flows? Yen: Let me start by a little look back in time. Taiwan first opened the domestic securities markets to foreign investors in 1990. Right now, equity holdings through foreign direct investment and portfolio investment account for 30% of Taiwan’s stock market capitalization. There are more than 10,000 foreign institutional investors (FINIs) in Taiwan. And about 6,000 accounts are active. What is interesting is that among these active accounts, around 20 are responsible for over 40% of all FX transactions by FINIs. Here are some more facts. The volume of FX trading undertaken by FINIs tends to swing wildly. This has frequently disrupted Taiwan’s FX market. By the end of last year, the accumulated net inflow of foreign capital related to portfolio investment has reached $166 billion. The total market value of foreign holdings in stocks, government papers, and bank deposits stands at $254 billion, or equivalent to 66% of Taiwan’s foreign exchange reserves at the end of last year ($382 billion). To prevent currency speculators from increasing exchange rate volatility, Taiwan’s central bank, the CBC, has urged foreign investors to deploy their funds in a manner consistent with the declared purpose of securities investment. A reporting system is also in place to track large FX transactions, in order to monitor international capital flows. And these efforts have been largely effective in maintaining order in the FX market, partly because the CBC has retained the power to carry out target examinations related to the implementation of foreign exchange and monetary policy. Above all, we believe that a country’s nominal exchange rate should be flexible, while the real exchange rate should reflect economic fundamentals. This will help prevent currency speculators from taking advantage of a rigid exchange rate regime when there are macroeconomic vulnerabilities. The central bank should also set up an effective system to monitor foreign exchange transactions. Maintaining an appropriate level of foreign exchange reserves can also help the domestic economy deal with financial shocks. As chief operation officer, Gibb is responsibile for driving performance across Taishin’s major business lines and functions. Since the beginning of 2011, Gibb has also been a board director of Taishin Financial Holdings. Prior to joining Taishin, Gibb was a director with Mckinsey, where oversaw the Greater China financial institutions practice, serving a broad range of domestic and international institutions. 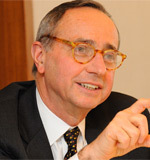 Prior to Mckinsey, Gibb spent several years with Merrill Lynch in the private client division. 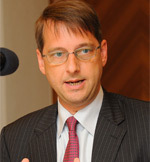 Gibb is co-author of Banking in Asia: The End of Entitlement (1999) and of Banking in Asia: Acquiring a Profit Mindset (2003). Gibb: The question of what is the purpose of trying to manage capital flows has always been somewhat of a challenge for Taiwan. The policies have been very effective at keeping the currency within a certain trading range and ensuring that the island’s exporters have a foundation for maintaining their competitiveness. But sometimes the more you try to control something, the less of it you have. Over the past decade, a relatively high proportion of Taiwan’s capital has gone offshore and stayed offshore. That’s partly because of its manufacturing base in China. Money gets moved to China. Money gets made in China, and then it gets held offshore. But there’s a lot of money that gets generated and produced in Taiwan that actually ends up in the financial centers of Hong Kong and Singapore. So, while Taiwan has managed capital flows very well, those policies might not have been effective in maximizing GDP and GNP growth. Hsu: The authorities have done a great job reducing excess volatility in the market. They implement the right measures to stabilize the market and provide a stable market for manufacturers, exporters and importers to do business in Taiwan’s market. GF: How does Taiwan build on the current economic momentum in a manner that will attract investment and produce jobs? Gibb: The policies Taiwan has pursued in the past couple of years, in terms of opening up with China, are absolutely right. It’s basically allowing the flows that naturally should be there to be there. But the Economic Cooperation Framework Agreement (ECFA) is just a ticket to the party, it’s not the party. Over the past decade, Taiwan in many ways had become less relevant, in part because China has become so much bigger. Falling under China’s shadow has, from a fund flow and an investment perspective, taken Taiwan off the map. The ECFA policies are getting things going again, but just letting Taiwanese companies move more quickly into China is not enough. Just exporting high-tech and agricultural products will be good for the top companies in Taiwan. But if you want a broader-based economic recovery, you need to really attract inbound investment. You need to create higher-paying jobs in Taiwan, and to have inbound human capital flows to expand the market. Taiwan has lots of competitive advantages that are not being exploited, partly because there are regulatory barriers and there is no vision laid out to drive the investment. Taiwan has the potential to be an R&D; center for greater China. It could be a health and retirement center, with its well developed and under-utilized medical system. It could be an educational center. Yen: Basically, successful and plentiful investment is a plus for job creation, wage increase, and consumption. In the past year, the government has focused on several promising industries, whose development can promote private investment. This year, the government will work actively to bolster domestic economic growth and improve the investment environment, particularly through incentives for private investment and attracting investment of private capital in public works. At the same time, the government will step up its efforts to promote Taiwan’s global investment promotion program. These endeavors are meant to reshape Taiwan’s industrial structure to the most advantage. The government will also carry out an array of employment-promotion measures. In addition, the ECFA also helps to create a favorable environment for strategic alliances between foreign and Taiwanese enterprises. We can take this advantage and make further efforts to attract investment in Taiwan from around the world, as well as encouraging domestic investment. Hui: There is lots of liquidity in the banking system but what Taiwan needs is beyond that. It’s not just financial capital. It’s human capital. Taiwan is heavily relying on IT exports and manufacturing, so growing R&D; and healthcare—and tourism—would be a good idea. But we need to define how we want Taiwan to develop—beyond just selling more into China. Attracting human capital into Taiwan from the whole of Asia, even globally, would be a first step. There is no reason why some of our top universities can’t tie up with the best schools globally to offer, say, executive MBA programs. That could become one of the drivers for the economy. Reinventing yourself is not easy, but Taiwan has this window of opportunity and we should use it. Hsu: One of the barriers to attracting talent is that Taiwan’s compensation level is among the lowest in the region, compared with Hong Kong, Singapore—even compared to Philippines or Indonesia. The government could play an aggressive role in addressing this, to provide a good environment to attract foreign investors to come here, or to provide attractive opportunities to do business here. We always look at things from the exporter-driven angle, and we always focus on tangible goods instead of the intangible. Maybe we should change the perspective and export services, such as banking services or medical services. Yen: Pay levels in the export sector are good because they are benefiting from the economic recovery, but others not related to the trade sector cannot get the same amount of salary increase. I agree with a lot of the comments on our economic policy. We already set a long-term target for developing our service sector, and developing that will take a long time. Hsu: Tax policy isn’t helping. Income tax here can easily reach 40% with an income slightly over $100,000 where in Hong Kong you only need to pay 15% and in Singapore it could be as low as 20%. GF: What will the ECFA mean to Taiwan? Hui: Historically, Taiwanese corporations have invested heavily in China, building factories that employ tens of thousands of people, but the flow of money couldn’t go directly from Taiwan into China. There had to be a conduit in between so Hong Kong and Singapore benefited from that investment. The cooperation framework allows a more direct interaction between Taiwan and China. It puts Taiwan on a level playing field, whereby it doesn’t require a conduit. Also, because of the lack of cooperation with China, Taiwan was not a major regional player. With this cooperation agreement, Taiwan has become a much more important player in Asia’s economy. Yen: The signing of the ECFA marks a milestone in cross-strait relations. The ministry of economic affairs has conducted its own assessment of the effects of the ECFA. Recently, the Peterson Institute for International Economics (PIIE) has published a policy analysis on the implications of the ECFA. I would like to cite some of their conclusions for your reference. For the economic aspect of the ECFA, the PIIE concluded that the projected benefits of the ECFA compared with business as usual are large for Taiwan and modest for China. And this will more likely be achieved through structural adjustment under the ECFA—rather than a boom in exports. In addition, the ECFA also has implications for enhancing Taiwan’s trade relations with other economies. As for the political effects, according to the PIIE paper, the increased economic dependence on China could reduce the chance of a military conflict across the strait, since Beijing will have that much more ability to deliver its influence in a nonmilitary manner. Since the ECFA has its historic significance, the PIIE analysis also notes its long-term implications in the political aspect for Beijing. GF: In the past, Taiwan’s investors made major contributions to China’s economic development. Now China is a major contributor to the Taiwanese economy. How will this shifting in roles affect Taiwan’s economic prospects? Hui: Taiwanese have been a major contributor in a number of ways to the Chinese economy by creating jobs, helping to build infrastructure and bringing know-how into China. Now we’re looking at what can China do to help the Taiwanese economy. In terms of the whole value triangle, Taiwan is very high-tech, with R&D; and the know-how, so it’s sitting on top of the triangle. China has a very low-end, low-value but high-volume economic industry. But they also have very deep pockets. They have the people, but they don’t have the know-how. Taiwan doesn’t have enough people, but has the know-how. If China invests into Taiwan, it will acquire the know-how while helping Taiwan’s economy. Gibb: Certainly, China can become an important source of investment into Taiwan. But there’s a second layer of opportunity. Prior to the ECFA agreement, China would block Taiwan from participating on a regional and global level in many bilateral agreements. If the opening with China changes China’s attitude to the extent that it will allow Taiwan to create those bilateral agreements, then Taiwan’s expansion into other sectors and other forms of development—and access to other forms of inbound investment—may be possible. They were simply blocked before. Yen: China is Taiwan’s largest trade partner, leading destination for foreign investment, largest export market, largest source of trade surplus, and second largest source of imports, so cross-strait economic and trade relations are very close. In addition to China, the ASEAN market is one of Taiwan’s leading trade markets too. Last year, Taiwan’s total trade surplus was $23 billion and of that figure, our trade surplus with China was $77 billion, while with ASEAN the surplus was $13 billion. Therefore, free trade agreements (FTAs) between China and the ASEAN have somewhat impacted our export industries. However, the signing of the ECFA with China brings several benefits. First, it helps to promote the “normalization” of cross-strait economic and trade relations. Second, it is expected to prevent Taiwan from becoming “marginalized” in the region. For example, signing an agreement with China may help us to sign FTAs with other countries. Third, the ECFA and FTAs with other countries can help Taiwan further integrate with the global economic and trade system and attract more multinational companies to use Taiwan as an economic, trade, and investment gateway to China and East Asia. GF: ECFA gives Taiwan’s banks an opportunity to move into the greater China market. How will Taiwan’s banks proceed? What role will the central bank play? Yen: The presence of a branch or an affiliate in China will be a great help in two ways: for Taiwan’s banks, they will be able to expand business; for Taiwanese businessmen in China, they will have easier access to funding. Taiwanese financial services firms have set up a commercial presence in China. Now, Taiwanese banks have set up six branches and six representative offices in China, and China’s banks have set up three representative offices in Taiwan. The FSC (Financial Supervisory Commission) is the authority to oversee cross-strait financial business activities, while the central bank is involved in the gradual achievement of a cross-strait currency clearance and settlement mechanism. 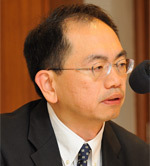 Considering the basic structural differences in the financial markets on both sides of the strait, such as openness, number of financial institutions, size of assets, and so on, we hope that future negotiations in this regard with China will help Taiwan’s financial businesses to gain a better advantage and a stronger footing in the China market. In the meantime, the CBC will also urge banks to ensure sound risk management. Hsu: The net interest margin spread here is around 130 basis points—the lowest in the world—the interest rate is so low, the whole yield curve is so flat, and the competition is so fierce that we have no choice. Once the door is open, we have to move into mainland China’s market. In this regard, what the authorities could be doing is being more visionary, looking at how to enhance the competitiveness of the banks here. How are we going to give Taiwanese banks an equal status compared with all the other banks, including mainland China banks and the other global banks? We’re not asking for a privileged position for Taiwanese banks, but at least we can have a fair chance to compete with the other banks around the world. Gibb: I totally agree. Taiwan’s banking industry needs to be restructured to create institutions that will be able to compete in China. Taiwanese financial institutions need to find a source of competitive advantage in China. That’s not going to be in mainstream corporate or retail banking because we just don’t have the distribution networks in China, and it will take decades to build a branch network in China that can be in any way competitive with a local bank in China. So the banks need to find the alleys where they can create value. That could be in leasing companies, where there are specialized skills, or in consumer finance, where not as much capital is required and the distribution model is different. It could be in asset management companies that are working out nonperforming loans. Taiwanese financial institutions do have a number of skills, which are clearly advanced compared to the Chinese banks, but it’s not in Main Street banking. For Taiwanese banks to eventually move into China does require some rethinking of the regulations. The regulation today under ECFA is driving the Taiwanese banks to Main Street because consumer-finance businesses, leasing businesses and specialized asset-management businesses are all excluded from the discussion. The sooner it can be shifted away from Main Street to the alleys, the sooner Taiwanese financial institutions will really start to think about where they can create those competitive advantages. GF: The ECFA has a reciprocal agreement that gives Chinese banks the ability to enter the Taiwan market. Will they take advantage of the opportunity, and how will the Taiwanese react? Gibb: I don’t think the Chinese banks have Taiwan on their radar. A few institutions will be highly encouraged to set up a few branches in Taiwan, but the Chinese banks in China are very clear on the dynamics of the Taiwan market. They know it’s not growing fast, the margins are thin and the media are very liberal, so if they make a mistake, it’s going to create an embarrassment for them globally. They’re much more likely to want to create an institution in Indonesia, which has fatter margins and higher growth, or to open another 500 branches in Western China as that benefits from the development of China itself. Hsu: I agree. The market had been wide open to all the global banks before. But the net interest margin here is 130 basis points, and the spread in the mainland China market can be as high as 300 basis points. Moving here doesn’t make much economic sense for them. From the perspective of Taiwanese banks, we are already used to competing with global banks, such as Citibank, HSBC and Deutsche Bank, so even if mainland China’s banks move here, I don’t think it would create any immediate threat to local banks. Hui: Taiwan is an over-banked economy. We’ve already seen two waves of consolidation, but some believe that Chinese banks coming in here would help accelerate the next wave of consolidation. Is that something that is on the central bank’s radar? Yen: If Chinese banks want to expand outward into the Asian region, then Taiwan’s market is essential. On the one hand, large Taiwanese enterprises that have established business in China will be their key target customers here. On the other hand, Chinese banks can also provide service to Chinese firms and businessmen based or traveling in Taiwan. Since Taiwan’s financial sector is more open and developed, Chinese banks may also take the opportunity to learn from us, reach out to Taiwanese banking professionals, and understand more about the business operation and credit history of their Taiwanese customers. In addition, the interest rate spread in the Chinese banking industry is between 2.5% and 3%, which means an even better profitability than Taiwan’s banks. Therefore, it seems that Chinese banks in the Taiwan market is more about making their presence felt rather than trying to grab a large market share. Their access into Taiwan’s market will not bring significant increases in profits or risks in the near future. In the future, under the ECFA framework, the FSC and the CBC will continue to negotiate on financial services with China and we hope to obtain more favorable treatment for each other. GF: Like banks in most parts of the world, banks in Taiwan are being controlled by new, stricter regulations. How will this impact the sector? Hsu: There are three things. The first is that the local authorities are emphasizing capital strength. Because the financial industry here used to be quite conservative, the leverage ratio is relatively low, compared to other countries. So the capital strength of the whole banking industry is in very good shape, which means that won’t cause too much concern. Second is new regulation to try to reduce market volatility, try to curb speculation. Again, Taiwanese banks didn’t invest that much in this area, so I don’t think that will have a big impact on local players. The third is about consumer protection. The authorities have already imposed quite a lot of new rules to protect consumers from buying all kinds of financial products from financial service providers. This one is going to affect a lot in terms of the sales approach to the local customers here. Gibb: The broader issue is, What is the intent of regulation? The sense I get is that it’s about preventing potential issues for consumers. In a simple way, that’s fine. But the role of a sound regulation policy should also be to create a healthy financial sector that will grow and actually support the broader growth of the economy. Taiwan’s strength is in manufacturing and export, and the whole thinking around regulation is set up for that. But the way you grow the financial sector is not the same way you grow an export or manufacturing sector. We have an opportunity to shift the intent of regulation to make the Taiwan financial services market bigger and healthier—not just to keep it within the rules of the law, but to actually grow it, to view it as part of the broader goal of growing GDP. Currently, that thinking is absolutely absent from the debate. For the regulation to grow the market and create a broader opportunity, it needs to be about how we enable Taiwanese financial institutions to succeed domestically and also regionally. And a lot of the regulations are not set up to allow that today. Hui: This also goes back to the international talents. Can Taiwan attract the international talent to really enable it to become an international player? That requires opening up, incentives and the whole infrastructure to support it. It also raises the issue of the incentive system for the regulators. If there is no incentive to get it right, but there’s a lot of penalty when you get it wrong, people’s attitude will not be too creative because they don’t want to be the first one to get it wrong. That may be driving some of the thinking behind the financial regulation. Yen: As a matter of fact, banking-related regulations in Taiwan are not particularly stringent. There are several new regulations on banking sectors that are related to the adoption of the international standards. For example, the FSC adopted the IFRS. The primary objective for those regulations is to build up a sound banking system here.